Native Plant Trust provides unique, comprehensive documentation of New England's rare plants. Though designed primarily for professionals who help rare plant species recover, these research-based documents have proven invaluable to other researchers—academics and students, scientists at public agencies and conservation organizations—within and outside the region. Detailed descriptions of these tools, Flora Conservanda New England and Conservation and Research Plans for 117 of New England's rarest species, appear in the green boxes below, along with free PDF copies available to download. We make our findings freely available to those who need them. Please donate to the Native Plant Trust to help us continue our crucial role in documenting the region's rare plants. Rarity often signals issues affecting the wider ecosystem. Unlike overburdened government agencies, we have the ability to work nimbly across state lines, to reach out personally to private landowners, and to receive private donations for vital research. Thank you! The only comprehensive list of plants in need of conservation in our region, Flora Conservanda 2012 was prepared by our staff, working with our colleagues in the New England Plant Conservation Program. It documents plants growing in New England that are rare globally, regionally, and locally. It also lists plants that are considered historic in New England (though they may exist elsewhere in the U.S. or the world) and plants whose status in the region was undetermined at the time but believed to be rare. Click here to download Flora Conservanda 2012. The 2012 list is a revision of the original document, published as the 1996 edition of Rhodora, the journal of the New England Botanical Club. We revised the list for 2012 based on research accumulated over the preceding 15 years, including taxonomic studies and field research by professionals and volunteers. We added species based on their rarity in the wild, and we removed others because we learned that they are more common than previously understood, or else our taxonomic understanding of the species changed so that it is no longer considered rare in New England. 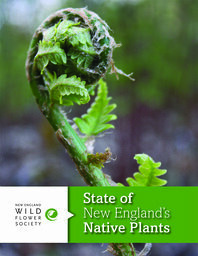 We view the 2012 list as a snapshot of plant rarity in New England at that time. Information such as the number of extant populations, state rarity ranks, and endangerment codes may no longer be current. For more recent data, please consult the latest state endangerment status and state ranks on Heritage Program websites. In 2014, we published an article in Rhodora analyzing the changes revealed between 1996 and 2012. Click here to download the article. More than 140 expert authors and reviewers contributed to this comprehensive series of Conservation and Research Plans for 117 of New England's rarest plants. We designed these plans for a variety of users: Government agencies, volunteers and interns, private landowners, and anyone else who wants to help rare plant species to recover. Read our in-depth technical report on this and other topics. Download "State of the Plants"